“DIU Intra University Girls' Programming Contest Spring 2019” among all the girl students of Daffodil International University was held on 12 April, 2019 at Labs of CSE Department of the university organized by Daffodil International University Girls' Computer And Programming Club (DIU GCPC). Mr. Shahriar Manzoor , judge of ACM-ICPC World Finals and Senior Lecturer , Dept. of Computer Science And Engineering of South East University was present at the award giving ceremony of the programming contest as chief guest. Presided over by Professor Dr. Syed Akter Hossain, Head of the Department of CSE, the program was also addressed by Dr. S. M. Aminul Haque , Associate Professor and Associate Head , Ms. Hasna Hena, Senior Lecturer and Mr. Shaiful Islam, Lecturer of the Department of Computer Science and Engineering. 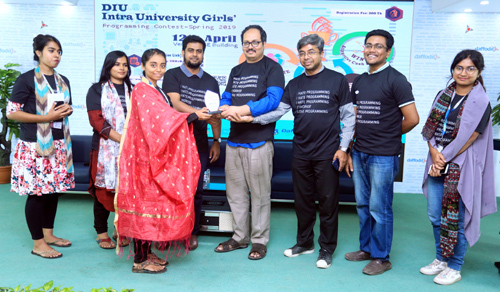 Mr. Shahriar Manzoor , judge of ACM-ICPC World Finals and Professor Dr. Syed Akter Hossain, Head of the Department of CSE along with winners of “DIU Intra University Girls' Programming Contest Spring 2019” pose for a photograph at the award giving ceremony. Addressing as chief guest Mr. Shahriar Manzoor said, if you want to fight against modern world, you must have to learn ICT knowledge. He gave emphasis on programming for enhancing ICT practice among young generation, especially girls. He also said that Bangladesh already has ahead in ICT sector. In future Bangladesh will be the leader in digital world. He expressed that ICT is the best profession for girls because this profession can be done from anywhere. In the meantime he gave emphasis on practicing ICT from very beginning of the life i.e Primary level, he added.